Clusters of silver atoms studded with hydrides combine with selected other small molecules to form a stabilizing shell. Reproduced with permission from ref 1© 2016 American Chemical Society. Small clusters of silver atoms arranged with atomic level precision are capable of becoming more versatile and useful due to a simpler way to hold them together. The nanoclusters assemble with help from carbon-based organic ligands that develop a shell around the metal atoms. Until now, most ligands have been big molecules that bond really strongly to the cluster and make its surface inaccessible to other chemical species. The smaller ligands developed at KAUST provide new opportunities in nanocluster design and should also increase the chemical uses for such clusters. Bakr and his team developed ligands known as hydrides as they are made up of negatively charged hydrogen atoms (or hydride ions) in direct contact with the surface of the metal. The small hydride ions interact with small phosphorus-containing organic molecules referred to as phosphines in order to develop a shell that helps protecting and stabilizing the cluster. Crucially, nanoclusters readily crystallize, enabling their structure to be accurately analyzed. The properties of a nanocluster can be altered with atom-by-atom control using this structural analysis to experiment with ligand design. 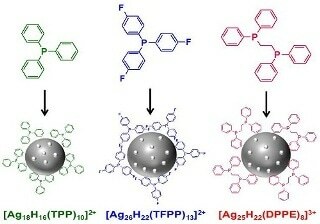 Nanoclusters can be used as catalysts to accelerate specific chemical reactions. Greater accessibility allowed by the smaller ligands widens the scope for reacting chemicals to reach the catalytic surface of the nanocluster. The increased availability of the catalytic surface also enables other molecules to be deliberately added in order to assist with catalysis. Researchers will be able to design new catalysts by understanding how the catalysts work, which is a significant motivation for the KAUST team’s research. These atomically precise nanoclusters are the key to understanding catalysis because, as we alter their size and shape, we can unlock the way in which catalysis occurs. The electrons of the metal atoms comprise of unique electronic and optical properties, as they are shared throughout the entire cluster. This enables the clusters to absorb light of several wavelengths and also to stay in an energetically excited state for a prolonged time period. The members of Bakr’s team are pioneers in providing silver nanoclusters properties that were earlier only seen in the extremely expensive clusters made of gold. This could be significant for transferring research findings into economically feasible applications. The next challenge is to see if we can apply these innovations to other metals and greatly widen their usefulness.